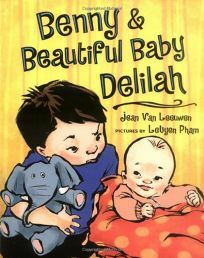 This tale of Benny the preschooler's resentment of his newborn baby sister Delilah offers few surprises-Van Leeuwen (The Amazing Air Balloon) assembles the usual emotional catalogue of newly minted sibling rivalry. Benny feels displaced (""She took Benny's place on Mom's lap""), neglected (the relatives coo over the baby and utterly ignore him) and resentful (""She was too little to play with trucks""). Even the resolution is expected: Benny forges a bond with the baby and embraces his new role as competent big brother when he defuses her late-night colic by making her laugh (""It was like the sun coming out""). But Pham's (Big Sister, Little Sister) handsome, high-spirited full-page and spot illustrations make every familiar observation seem fresh, funny and-most important from a young reader's standpoint-emotionally charged. She never depicts the hero as down and out-her Benny will not be ignored. Thick, emphatic ink strokes capture how Benny's physicality expresses his stormy inner states; a scowl seems to call upon every muscle in his chunky little body. But even as Pham embraces Benny as a piece of work, she provides the story with an emotional bedrock in the form of his parents. They may be a bit distracted, but they come across as loving, patient and understanding. Because they so clearly have faith that Benny will come around, readers can believe he will, too. Ages 4-up.